To see a PDF copy of this report, click here. 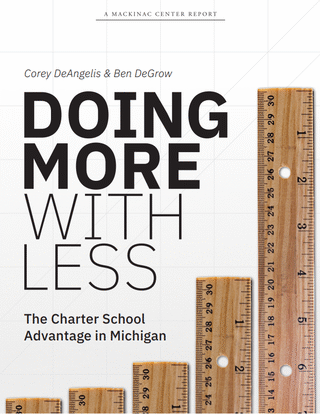 In this study, we reveal that charters in Michigan are more cost effective and produce a larger return on investment for taxpayers. These results persist even after controlling for student demographic factors that research suggests impacts both a school’s funding levels and its average student test scores. These factors include the portion of students receiving special education services or who are English language learners, the average socioeconomic background of students in a school as well as the race and gender composition of a school’s students. On average, Michigan charter schools receive about $2,782, or 20 percent, less per pupil than traditional public schools. Based in part on this funding disparity, the average public charter school studied is 32 percent more cost effective than the average traditional public school located in the same city. As measured by expected lifetime earnings of each student, the average charter school generates about $2.63 more return on investment for each dollar it spends — 36 percent higher than the average traditional public school.